Doomsday Clock Set At 5 Minutes To Midnight, But Why Now? On Tuesday, the ominous time on the Doomsday Clock was determined for another year: Five minutes to midnight, or 11.55 p.m. So exactly what is the Doomsday Clock? The theoretical Clock, a cheery analogy representing how close the world is to doom, is set at the beginning of each year by a team of University of Chicago atomic-bomb researchers. They're the same people that created the nuclear weapons America dropped on Hiroshima and Nagasaki in 1945, and they've been predicting how close the world is coming to nuclear destruction in their magazine-turned-website, The Bulletin of the Atomic Scientists , since 1947. The imaginary clock hasn't moved since 2011, when the Bulletin decided it would be permanently set at six minutes to midnight. It'd been one minute forward the year before, but thanks to international cooperation on climate change, it was determined that we're now one-fifth less close to doomsday. (Yay!) Unfortunately, thanks to a complete lack of policy agreement between American and Russia in 2013, not to mention the very, actually real issue of climate change, we remain five minutes away from Doom this year. Happy 2014, everyone! So when has the Clock been the furthest from midnight? That'd be 1991, when the Soviet Union dissolved, and the Strategic Arms Reduction Treaty was signed, which ultimately saw 80 percent of the world's nuclear weapons destroyed. 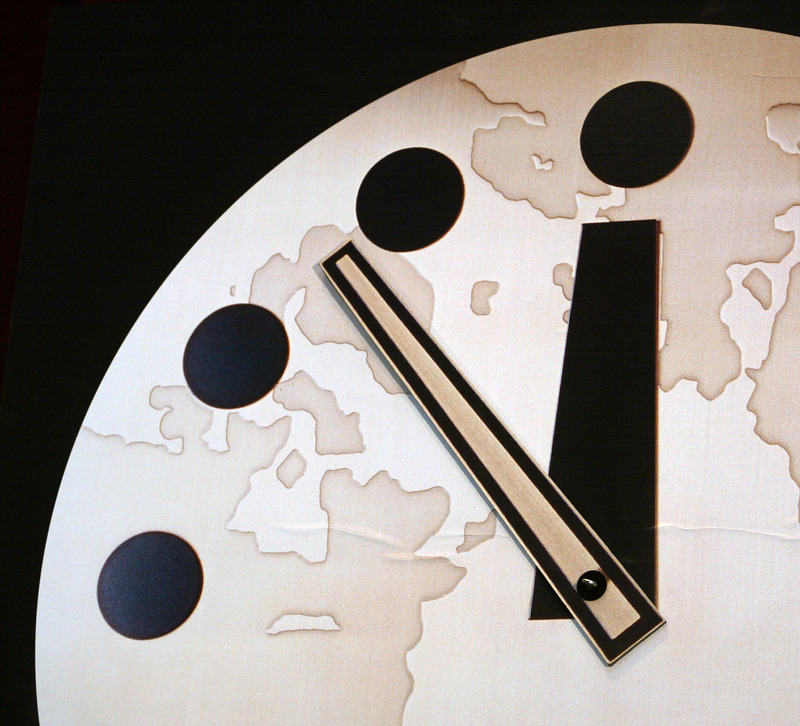 Until 2007, the Clock solely represented how close the world was to nuclear destruction. After nuclear weapons were used in World War Two, they were seen as the most likely reason Earth would meet Doom, but as climate change hit the public eye, the Bulletin agreed to incorporate global warming into their prediction, plus any new technologies that could see the world inching closer to Doomsday. So many options, so little time! The institute’s chief scientist likened the field of science to a child playing with a dangerous weapon, maybe forgetting that he was a leading scientist. So what kind of experiments might go awry? Well, synthetic biology, for one — growing human organs, prolonging life, and so on. Researchers are already growing tiny organs from human cells all over the world. In other extinction risks, we have the rise of machines: robots are becoming increasingly intelligent, much like every sci-fi movie starring Will Smith. And then we have nanotechnology, which is a fancy word for nuclear and chemical weapons. So how did the Doomsday Clock come about in the first place? Well, in 1947, during the aftershocks of World War Two, some of the University of Chicago researchers who'd worked on the atomic bombs dropped on Hiroshima and Nagasaki began predicting how close the world was to Doom. The bombs America had dropped on Japan were the first time nuclear weapons had ever been used — and, thankfully, remain the only use of nuclear weapons to this day — and it was expected that more incidents would come. In their now-online journal, the Bulletin Of Atomic Scientists, a University of Chicago team called the Science and Securities Board began making yearly predictions regarding the time of the "Doomsday Clock." In the last five years, they've also held Annual Doomsday Clock Symposiums, where leading researchers present their understanding of how and when the world will end — and what we can do to prevent it. There's bad news: The clock has moved forward 12 minutes in the last 20 years, largely because researchers believe there's an increasing capacity for nuclear-weapon use between international powers. (No thanks to North Korea, BTW.) Since its inception, the Clock has been reset just 20 times: it moves back whenever international treaties are signed limiting or destroying nuclear weapons, but edges forward whenever international powers test out nuclear weapons (India; Pakistan; Russia) or don't move forward on the climate-change issue. This year, the Bulletin researchers wrote specifically to U.N. Secretary General Ban Ki-moon to update him on the incoming Doom. While they praised the scaling back of Iran's nuclear-weapons program, thanks to intervention from America and others, they concluded that an influx of "new technologies" still posed a real threat to the planet. As always, new technologies hold the promise of doing great good, supplying new sources of clean energy, curing disease, and otherwise enhancing our lives. From experience, however, we also know that new technologies can be used to diminish humanity and destroy societies. Doom by giant 3-D printers, anyone?